Emilia-Romagna is an administrative region of Northern Italy comprising the two historic regions of Emilia and Romagna. Emilia Romagna today is considered as one of the richest and most developed regions in Europe and has the third highest GDP per capita in Italy. 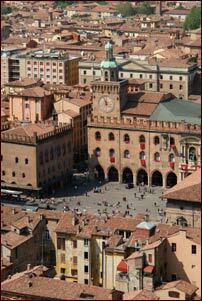 Bologna, the region's capital, has one of Italy's highest quality of life. Emilia-Romagna is also a major cultural and touristic centre, being the home of the oldest university in the Western World, containing numerous Renaissance cities (such as Modena, Parma and Ferrara), being a major centre for food and automobile production (Emilia-Romagna is home of numerous iconic gastronomical and automotive industries, such as Ferrari, Lamborghini, Maserati and Ducati) and having a lively and colourful coastline, with numerous tourist resorts, such as Cattolica and Rimini. The climate is characterized by warm and sultry summers and rigid winters with abundant precipitation and frequent days of fog and cold. Along the coastal Adriatic the climate is milder; on the mountains abundant rains and snowfalls are frequentl. Snow falls also in the lowlands however here the snow immediately vanishes and is loosened by the wind. 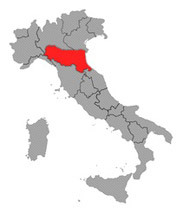 Emilia-Romagna counts 9 provinces: Bologna, Ferrara, Forlì-Cesena, Modena, Parma, Piacenza, Ravenna, Reggio nell'Emilia, Rimini. 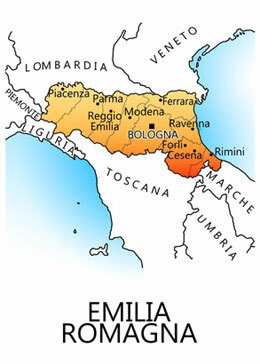 The name Emilia-Romagna has roots in the Ancient Rome legacy in these lands. In the II century before Christ an important Roman way was built that connecting Rome to the northern part of Italy. It was called Æmilia in honor of the consul Roman Mark Emilio Facetious. The Region was later named after that way. In the VI century after Christ the Romans lost this territory which was divided between the Longobardis and the Byzantines. The coastal area of Emilia, which was ruled under the Byzantines from 540 to 751, became known as the separate region of Romagna. The land rules by the Longobardis became known as Longobardia. With the unity of Italy, the Region acquired the aboriginal name of Emilia. Only in 1947 the was the actual name of Emilia Romagna assigned. YourGuidetoItaly.com 2005-2013 © All Rights Reserved. Photos of the YourGuidetoItaly.com banner (from left to right): (on campus) Sean Locke, (red deckchair) Valentina Jori, (chianti botlle) Donald Gruener, (Vitruvian man) Jodie Coston, (coliseum), Roberto A Sanchez, (Fiat 500) Luca di Filippo. Photo of 'Rialto bridge' by S. Greg Panosian. Italy regions image by Frizio.